【High-quality Basswood & Anti-break Color Pencils Refills】-This colouring pencil set is made of environment friendly top quality colourd refills to restore the original vivid and vibrant colours. NON-TOXIC,and be safe to use.Sturdy and unbreakable prolonged use. 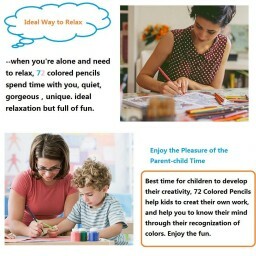 【72 Colour Pencil Set for Creation of Drawing】-This range of colour pencils with a wide range of colours from subtle to vibrant is hexagonal in shape and very easy to work with and colour in Professional pencils set for kids and artists creating drawing. 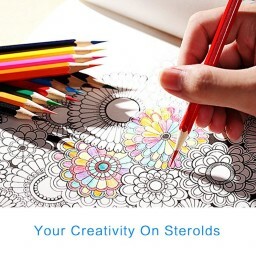 【Oily Soft Core Colours Pencil & Strong Performance for Painting】-Oily coloured pencils with case is easier to coloring, and has strong colour-keeping capability, the colour expressive force and the visual impact. More fabulous in colour and good gloss. 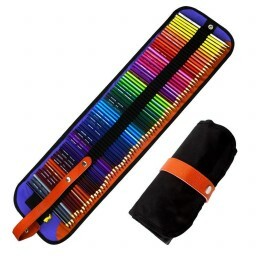 【Multi Colouring Pencil With Nice Rolled-up Canvas Case】-Those colouring pencils are stitched well to hold everything and has individual slots for each pencil, well protect pencil nibs from being damaged and very handy for storage and use on the go. It can be rolled up, and then unrolled for a full view of all the color pencils inside. A sharpener included. 【Perfect Gift of Coloured Pencil Holder for Painting Lovers】-72 Colour pencils set Offers a wide range of coloring possibilities for creating an amazing painting. Wonderful gift for kids to develop their artistic talent as well as for professional painting lovers to creat their beautiful paintings. https://www.giveawayservice.com/p/r3j6v3w9/p9q9v3t5q9 I cant recommended these pencils enough, they even come in a sturdy, high quality fabric case which can be rolled up for transporting, even the pres stud fastening are high quality. 72 coloured pencils and sharpener, the perfect way to spend a day off work. Check these colouring pencils from #Jhua - great pencils https://t.co/UmV6N6yuNz #colouringpencilsset #Jhuacolouringpencils #oilbasedcolouringpencils These colouring pencils come in a very nice, roll up nylon case which keeps all the pencils in order, tidiness and it’s easy to store. It can be taken anywhere because it’s compact and easy to store. It can be used opened on the desk or attached vertically on the flip chart. Inside the case, there are 72 colouring pencils and 1 pencil sharpener. The pencils are oil based, sliding on the paper as smooth as possible. The colours are vibrant when desired, but gentle at the same time. It offers a beautiful spectrum of primary to tertiary colours making these pencils a decent product for the price. Each pencil has its own colour name. Easy bendable, will prevent from snapping, although I saw that they burn out a bit fast. 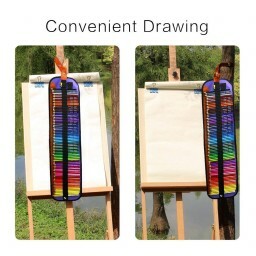 These will make a great present to anyone who loves drawing (regarding of the age), they offer a big range of colours, a nice rolled-up nylon case, altogether: a decent product for the price.